Khao San Road. It’s arguably the most famous (or perhaps infamous?) backpacker/tourist street in Southeast Asia (if not the world). If you’re a budget traveler in Southeast Asia, chances are you’ll end up here are some point. All roads seem to point here and it’s the transit hub for backpackers in the region. It’s a street brimming with food stands, bars, locals hawking cheap souvenirs, and backpackers from every corner of the world. Here on Khao San Road, you can grab a beer and some banana pancakes at all hours of the day as the entire street caters to the whims of its backpacking guests. If you’re booking a bus or a tour, chances are you’ll be leaving from somewhere near here. And while travelers will always complain about it being too expensive, loud, and touristy, it’s magnetic nature draws us back to it over and over again because we know that no matter what happens we go there to meet people, make travel plans, and get away from it all! The street food on Khao San isn’t that good. For better food, go one street over to Soi Rambuttri. There is a little group of food stalls outside the 7-11 and the Pizza Company restaurant that serve authentic Thai food at a cheaper price. Additionally in the roundabout across the street, is a decent local market! Never get a taxi or tuk-tuk from Khao San. You WILL get ripped off. Walk a couple of blocks to the main road and hail a taxi from there. Make sure they put on the meter! Brick Bar is the best place to hear local Thai music and is one of the few places on the street that caters to Thais over tourists. It’s behind the McDonald’s. Shamrock plays great live rock music. The outdoor drinking stalls and Center Khao San are the best places to meet other travelers. Start your night there! D&D Inn offers really clean private rooms, air conditioning, a decent breakfast, and a pool for 500 baht a night. It may be comparatively expensive but for what they offer, it is a great deal. 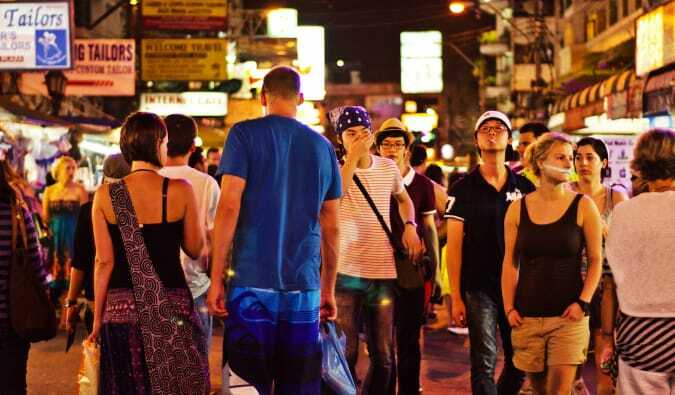 With so many drunk foreigners in one place, Khao San Road is an easy target for pickpockets. Be vigilant. There are a lot of scams and ripoffs here. Avoid buying anything valuable here like jewelry or tailored suits. The quality is going to be pretty poor. Shop elsewhere for those. 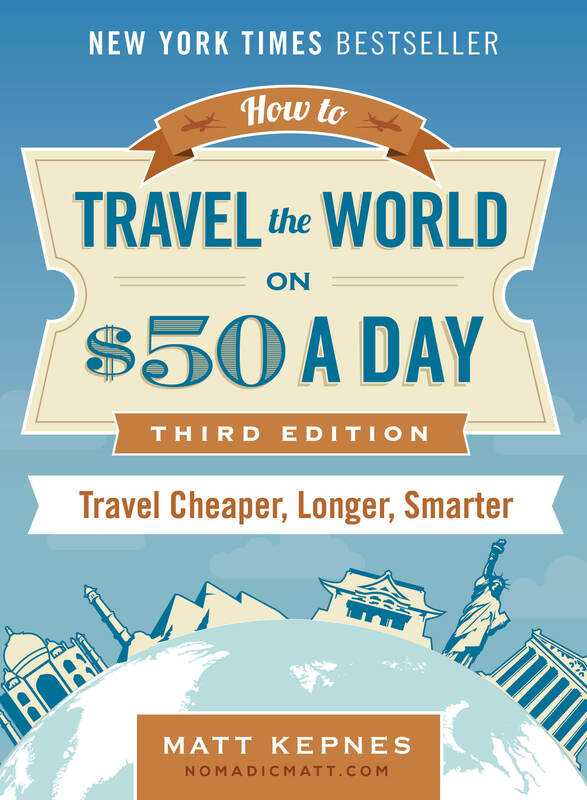 My detailed, 80 page guidebook is made for budget travelers like you! 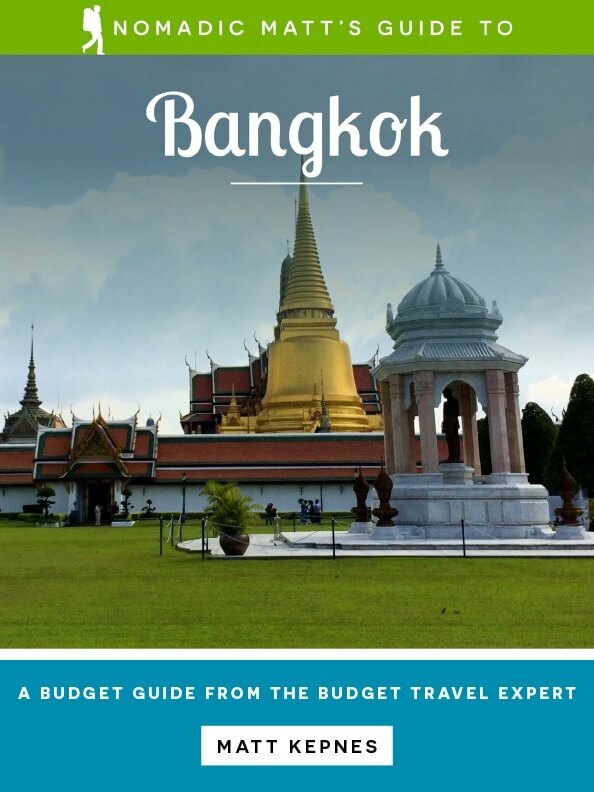 It cuts out the fluff found in other guidebooks and gets straight to the practical information you need to travel and save money while in Bangkok, a city I used to call home (so I know it really well!). You’ll find suggested itineraries, budgets, ways to save money, on and off the beaten path things to see and do, non-touristy restaurants, markets, and bars, and much more!! Find a cheap flight to Bangkok by using Skyscanner or Momondo. They are my two favorite search engines. Start with Momondo. P.S. At least on my laptop the video is on full screen. Having just spent quite alot of time in and around Thailand, including a good chunk in Bangkok and around Banglampu, I’d have to say that the food on KSR, whilst not incredible, is at least consistent. I have eaten there a number of times, from carts and from restaurants, and have never had an upset belly as a result. Plus, at about US$1 a plate, the price is right. Also, I have managed to swing some very good bargains there – not sure whether it would be “local price”, but it was certainly enough to impress another expat who has been in Thailand for 30+ years. KSR is an experience – you have to sample it at least once to understand the love/loathe relationship most backpackers tend to develop with it during their wanderings around South East Asia. Good video, but some more content (ie shots of the street, stores, goods on offer) rather than just the presenter speaking to a static camera would really help to convey the message and the content. We can see you – take advantage of it. Thanks for the feedback. I’m trying to get more shots of the area in future videos. The food on KSR is ok but it’s not great thai food! Matt – here’s my comment about the vid. The tips you are offering are interesting, but that’s why you have a blog – to provide content. Your vids will be really powerful if they can offer us readers something the blog *can’t* – the visual and audio EXPERIENCE of being where you are. You have the ability to actually invoke the emotions of traveling (while still offering us the actual information in your text) – you don’t even need to be in the video at all to pull this off. It can be shots of the scene – people, places, clubs, hostels, dance parties, whatever – with a soundtrack, and text written on the screen instead of spoken aloud (maybe a shot that says “1: Drinks” – music playing, quick-change shots of bars, people drinking, a menu, whatever. “2: Backpackers”.. etc). I’m no videographer OR blogger, but when I clicked play on the video, that’s what I was hoping to see.. I wanted to get transported into your life for 2 minutes, to be overwhelmed by KSR, to feel what it’s like to BE there with you. That’s what will get me hooked. You’re wonderful and charming and we all love you, but I won’t watch videos of you speaking to the camera and giving me tips. Reading them is faster (and less suspicious when I’m at work). Think about Where The Hell is Matt – that’s why he went viral… it was an emotional experience watching the vid.. visual sensory overload of amazing scenery, 5-10 seconds each, descriptive words at the bottom, with an appropriate soundtrack. It was easy to connect to him and his experience and see the world through his eyes – without him saying a word. I know your goals are different than his, but when it comes to video as your medium, it’s an effective approach. Thanks for the great tips and suggestions here. I do plan to include more local scenes and sounds in future videos. Hey Matt! I once had the same problem with my video; it was in the rendering settings – there is likely something not congruent between the import resolution of your video and the export of the rendered product. Try to render just 5 seconds of video changing these kinds of settings (not sure where they ar ein Adobe) and you’ll find the problem! Its all in the preset settings in the encoder/ Flv web widescreen should work when rendering. Hope that gets you started. In adobe there is an option to make the editing screen compatible with the video input. Youtube will play whatever is uploaded. 4:3 is TV screen and 16:9 is widescreen. Ok, intern, next assignment: teach me Adobe. we’ll add that to the list of things that we’ll do! You can teach me something! Less talk more action on the videos… I think videos are on the to-do list for many bloggers – so full credit for getting them started. I found that there’s far better value accommodation just around the corner at Soi Rambuttri – amazing how the prices drop in just a few streets. Keep the solid video content flowing, buddy!!!!!! I am always amazed at how fast Khao San Road gets modernized and commercialized every time I see it. The entire world is getting so Westernized so fast. There was no McDonald’s or 7-11 on my first visit to KSR. It likes like a scene from the movie Blade Runner now. hey its quite cool..we have been wanting to do some videos too..currently am just using some slides and some VO.. I prefer going to Brick Bar there because there is hardly any tourists there since it’s a bit hidden away. Soi Rambuttri is also a lot more low key. But in reality, if you want to hang out with Thais, Khao San is not the place to go. Ekamai is where you want to be. I just did it. Found out my guy would be happy to dog sit and stay home while I go to Thailand. Going in November and returning a month later in December. Why does it take me a few days to just book that flight? Is it stepping out once again from the comfort of home? Than in the spring, 2017, I have promised to take my guy with me to possibly Panama, he just can’t keep up with all my walking, so this will be a shorter and easy little trip. On the road again in 2016 after a year of small trips closer to my homes. Even used ALL my air miles, guess I will have to start charging up more for that spring trip. On the road again, oh wow! Thanks Matt for all the Thai advice I will be reading up and booking a place for when I arrive! 68 IS NOT too old or too late!